People who say they witnessed a state trooper crash his car and try to speed away are questioning why key details weren't included in the police report. A resident spotted a pickup truck that had veered up on the sidewalk and struck a utility pole, knocking out power to the neighborhood. There was no indication the police had ever tested the driver for alcohol or other signs of impairment. The person who crashed into the neighborhood was Michael Cogan, a trooper with the Massachusetts State Police. Mike Laquidara was watching TV with his wife late on a Friday night when a loud booming noise jolted him from the couch inside his Wilmington, Massachusetts home. Looking outside, Laquidara spotted a pickup truck that had veered up on the sidewalk across Woburn Street. The truck had struck a utility pole, knocking out power to the neighborhood. Laquidara watched as the driver tried to make a U-turn on Woburn Street with one of the truck’s wheels missing from the collision. It went over the curb into his yard, where it got stuck. Laquidara and several other neighbors called 911 to report the commotion. They told dispatchers it looked like the driver was trying to leave the scene. “He’s spinning in the road. I don’t know what he’s doing, but now he’s stuck in a ditch,” one woman said. “A guy hit a light post and knocked the power out. And now he’s trying to get away on two wheels,” another caller said. Police and other emergency first responders arrived and eventually took the driver away in an ambulance. Laquidara said he didn’t think much of it until he later received a copy of the police report for his insurance. He noticed the report included no details about what he and neighbors had witnessed, like the attempted U-turn or the spinning, smoking tires. There was also no indication the police had ever tested the driver for alcohol or other signs of impairment. 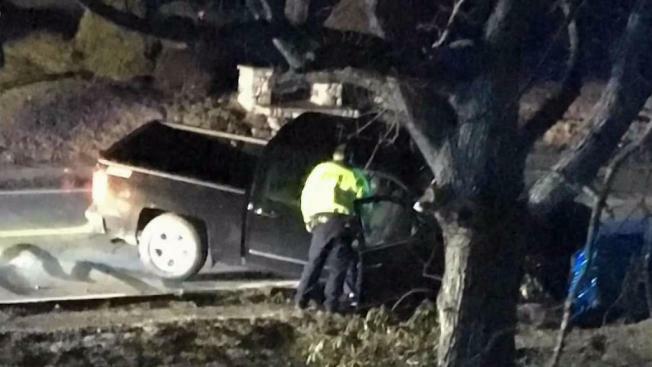 That is when Laquidara plugged the driver’s name into an online search, which revealed the person who crashed into the neighborhood was Michael Cogan, a trooper with the Massachusetts State Police. “That’s when everything made sense,” he said. When the NBC10 Boston Investigators started asking questions about the crash, Wilmington Police Chief Michael Begonis ordered an internal review of the incident. He then sat down to discuss the findings, acknowledging his department could have conducted a more in-depth investigation. There were also key observations from Wilmington firefighters who rode in the ambulance with Cogan. They told internal investigators they smelled alcohol on his breath. Firefighters also said Cogan told them he swerved to avoid an animal, but was inconsistent about what kind of animal, saying at different times it was a dog, a deer, and a muskrat. Firefighters did not recall communicating any of their observations to police, though. Finally, despite the circumstances, officers did not ask Cogan if he had been drinking or conduct a field sobriety test. The Wilmington officers who responded to the crash told the internal affairs investigators Cogan identified himself as a state trooper at the scene. As part of the internal investigation, police tried to obtain medical records from Winchester Hospital that would show whether or not Cogan had alcohol in his system. However, it turned out he never even saw a doctor at the hospital that night. Instead, he checked himself out and got a ride home. The NBC10 Boston Investigators contacted Cogan to ask about the circumstances surrounding the crash. When he didn’t respond, the Investigators approached him during one of his patrol shifts. “I don’t have any comment,” the trooper repeated as he walked to his department vehicle and drove away. Wilmington police forwarded their investigation to the Middlesex District Attorney’s Office, which declined to file charges. “In light of the fact that no citation was issued either at the time of the incident or shortly thereafter, charges may not legally be brought in this case pursuant to both statutory law and recent Supreme Judicial Court precedent,” Middlesex DA’s spokeswoman Meghan Kelly said. Massachusetts State Police now tell the NBC10 Boston Investigators the department has reviewed the Wilmington investigation and opened its own internal probe of the crash. “The investigation will examine whether any violations of State Police policy, rules or regulations were committed,” spokesman Dave Procopio said. Along Woburn Street, there is still evidence of the crash: the tire marks on the street, the chunks of pavement from the curb, and the path of the rotor from the missing wheel as it carved its way along the sidewalk. Laquidara is glad the crash received heightened scrutiny, but can’t help but feel frustrated. Ryan Kath can be reached at ryan.kath@nbcuni.com. You can also follow him on Twitter or connect with him on Facebook.